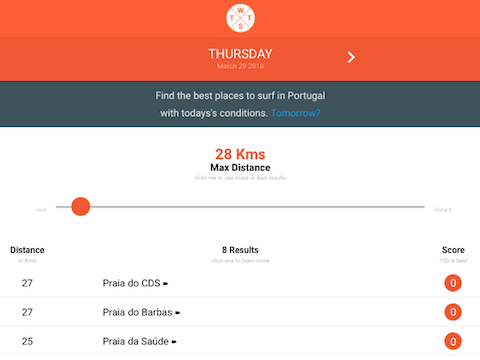 Imagine you are in Portugal, you want to go surfing, but you don't know where the best waves are. Well, you open your surf guide, see what surf spots are near enough, search for a beachcam on that spot, and after some thorough evaluation, you finally decide where to go. Now it's time to search for the spot on Google Maps, and get some directions. Wouldn't be great if there was a simpler way of doing all this? That's why I made https://wheretosurftoday.com some time ago. And how exactly it solves the problem?